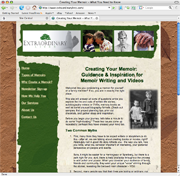 Memoir Musings, Issue #103--June issue--Can Family Reunions Be Fun - Even for Teenagers? Older family members tend to enjoy reunions more than younger ones (no surprise there, something worth correcting). The more structured the event, the higher the enjoyment factor for every age. Cookbook: Ask each family to bring a favorite covered dish, and the recipe to share. Take a picture of each family with their dish. Secure a volunteer to organize and type the recipes for sharing. You may be able to print and bind these and sell copies to family members, recouping any costs involved. Matriarch/Patriarch Story: Ask each family to share a favorite story about the family matriarch/patriarch. Record the stories and make copies available to the group. Family Reunion Genetics: Draw a 3 or 4 generational family tree on poster board. Have each family fill in some key physical characteristics, such as eye color, hair color and height. It’s interesting to see the dominance of some traits and the generation-skipping of others. Family Timeline: Get hold of some rolls of paper from a school supply store. Spread it out and make a month/year timeline, going back to the birth of the oldest person attending. Bring it to the reunion and invite each person to write key events/memories on the timeline. It’s a great way to start a family history project. Keep the roll, and add to it at each reunion. Plan a scavenger hunt for the kids, having them find family members with certain stories, traits, or physical characteristics. Through games, you may really get the generations connected. Play Generation Bingo – create bingo cards with lifestyle items as the categories (i-Pods, hearing-aids, diaper ointment, picture of kids, blue nail polish, etc.) When everyone is gathered, pull and call the items and find some winners! To encourage cousins to interact, play games that pit generations rather than families against one another. Good options include: ladder ball, horse shoes, water balloon toss, or team word scrambles. The key is to encourage interaction, fun and activity. Create an environment where family similarities and differences are a source of joy, rather than frustration. And there is likely truth in each of those statements. Take it as a challenge, and see if you can engage the kids before you ever leave home. Here are some ideas to get the kids involved in knowing more about their extended family. Young school-age children may enjoy a day-by-day scrapbook for the trip. Make a simple book, with a page or two for each day. Include a map for the route you are travelling. Encourage them to write or draw about a favorite activity each day. To help the children get to know their relatives, help them make a photo directory of grandparents, aunts, uncles and cousins. You can either make a booklet, or just have photos printed off. In either case, add the person’s name, relationship to your children, and perhaps their birth date. Add a category or two to have the kids fill out once they meet…favorite singer, favorite place, where they live, or something that might interest your own child. To engage the kids in the whole process, have them make a list of their own interests (i.e., music, sci-fi movies, soccer). Give them the “assignment” to find at least one other person who shares each interest. Another story idea is to have them “find the dirt” on you! Challenge them to interview your parents/brothers/sisters to find out some interesting tales about you growing up. You might give them a head start with a teaser topic. One of the best ways to engage teens is to put them in charge of the younger ones for some planned activities. Let them select the prizes for the games too. One last suggestion; before any conflict arises, set the ground rules for using cell phones, iPods and video games. It is easy for tweens and teens to never “be” at the reunion, even if they are physically present. Settle this beforehand to avoid major problems at the reunion itself. Visit www.ExtraordinaryLives.com and check out our News Room, with links to press releases and an event calendar. You’ve attended a few (or many) reunions…what memories and stories have reunions provided to you? How did reunions start in your family? What locales have been used? What have been your favorites? Have any family mysteries been solved? Have new mysteries been revealed? Who are the “dark sheep” in the family? Why? Who do you most resemble in appearance? In personality? Who have you established a friendship with? What have you heard/learned about your parents? What have you heard/learned about your grandparents? What do you now know about the places your family came from? Do you know why they came to America, and under what circumstances? How does it feel to be part of this (bigger) family? What do you hope your children receive at reunions? Capture the essence of one year in one stylish, high-quality and affordable family yearbook. Each family member contributes digital or scanned photos and stories to a special website. Once all contributions are added, the book and cover are automatically designed and printed, and in two weeks, mailed to you. It’s easy, fun, and quick. An Extraordinary Lives MemoryPress© book project, which you can launch using the link below. The editor purchases a book project on our website, selects a basic book design and sets up a table of contents. He adds the family email addresses, to which personalized e-invitations are sent. The contributors click on the project link in the email and visit the site to add their photos and stories. The books are mailed to you in two weeks. The possibilities are endless: You can set up a chapter for each month, each big event, each family member…you choose! Imagine the fun of looking at your family yearbook as the years go on. Can you think of a more meaningful gift for a grandparent than such a book from each branch of her family tree? Thank you for subscribing to Memoir Musings. Please email or call 513.385.1637 with any questions or suggestions.